Orchard Cottage is living up to its name at the moment. 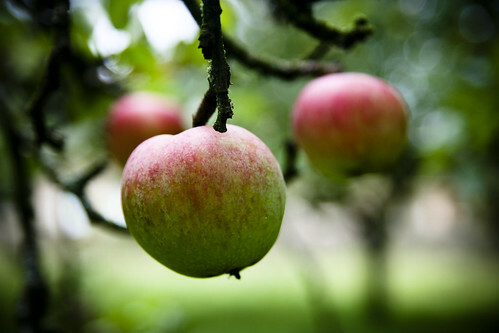 When I look out the window, all I see are a bundle of trees, branches dripping with ripe and ready apples. The mind reels with how to use them all. 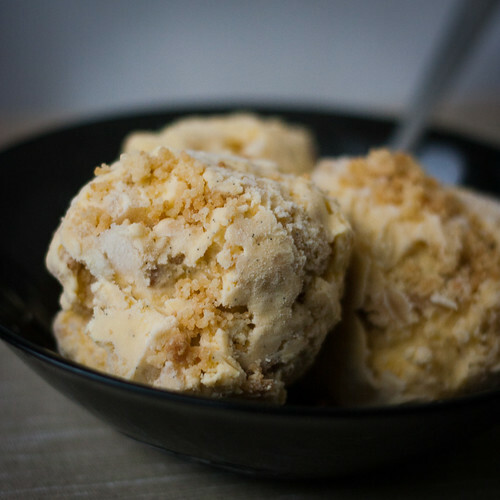 Well, here’s an invention I came up with last weekend: apple pie ice cream, though I should really call it “apple crumble ice cream” because crumble topping is what I ended up using for the “pastry effect”. And indeed, that pastry aspect is essential – after all, one of the best bits of apple pie is buttery pastry. I would have used pre-baked shortcrust pastry, but I happened to have crumble topping stashed in my freezer and was feeling lazy, so I toasted that the oven for 10 minutes and went to town. The crumble topping worked amazingly well, retaining its crispy texture even after being swirled into the ice cream. That said, I do want to try this again with proper pastry, something a little softer with more chew. Crumbled up cookies or biscuits could also work in a pinch. 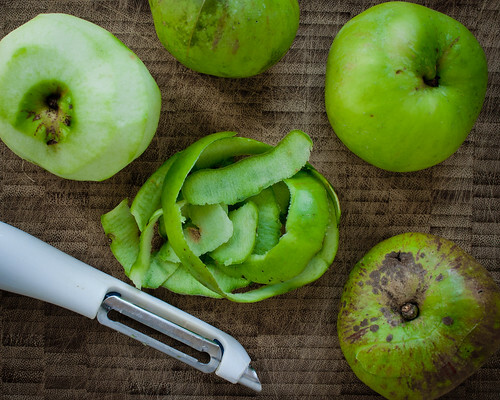 As for the apples, those get stewed up with some spices – I use cinnamon and nutmeg – plus the magic ingredient, stem ginger, which gives it a spice kick and adds a further bit of texture to the whole mixture, which gets cooked up in a pan until the apples just start to fall apart. 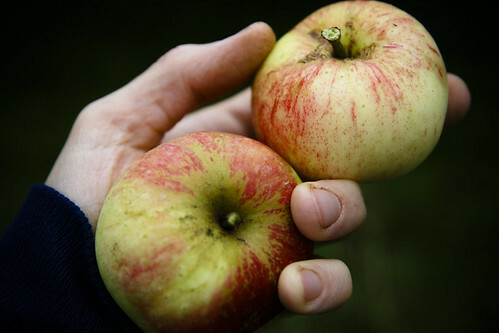 Depending on the size of your apples, you might not need all of the apple mixture, which is ok because you can serve the leftovers with the ice cream itself. 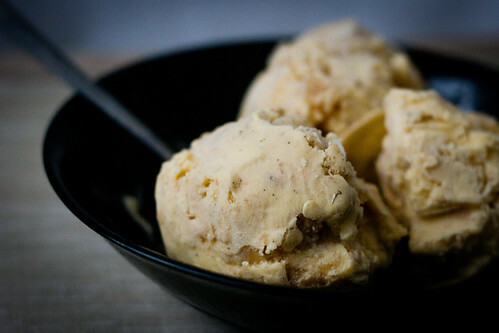 The ice cream base is a basic vanilla custard adapted from David Lebovitz‘s The Perfect Scoop . I toyed with adding cinnamon to the custard, too, but in the end decided to keep it simple and allow more of a contrast between the ice cream and spiced apples. I’m glad I did this. One point that requires some finesse is the swirl. I’d be tempted to let the ice cream custard freeze for 30 minutes or so before swirling the apple in. Fresh out of the churn, the ice cream is still a bit soft, which makes for less of a swirl and more of a mix-in. Still, it’s good all the same. Feel free to bump up the spices or add any additional spices that sing of apple pie to you (a bit of all spice might not go amiss). Heat the milk, 1 cup of the cream, salt, and sugar in a saucepan. Scrape the seeds from the vanilla bean into the milk with a paring knife, then add the bean pod to the milk. Cover, remove from heat, and infuse for one hour. While that’s infusing, prepare the apples: melt the butter in a saucepan on medium heat then add the apples, stem ginger, brown sugar, cinnamon and nutmeg. Cook on medium heat until the apples start falling apart, but you still have some texture of the whole apple remaining. 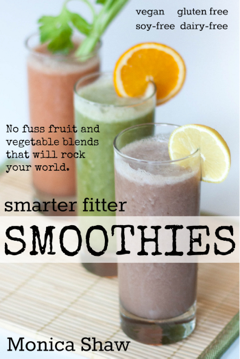 Taste it – you may need to add more sugar depending on the size of your apples. Add the rum if you like and cook for another minute. Remove from heat and leave to cool. Move on to the ice cream: Set a strainer over a medium bowl and pour the remaining cream into the bowl. In a separate bowl, whisk together the egg yolks. Gradually pour the infused milk mixture into the yolks, whisking constantly as you pour. Scrape this back into the saucepan and return to a low heat. 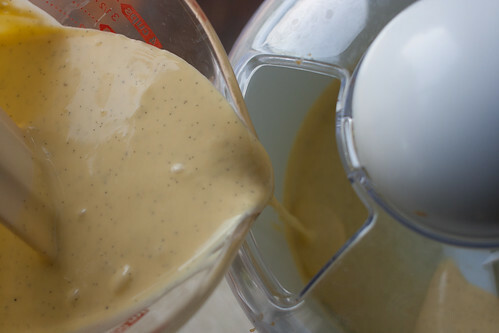 Strain the custard into the heavy cream, add the vanilla extract and stir to combine. Leave to come to room temperature (you can speed this up by using an ice bath). 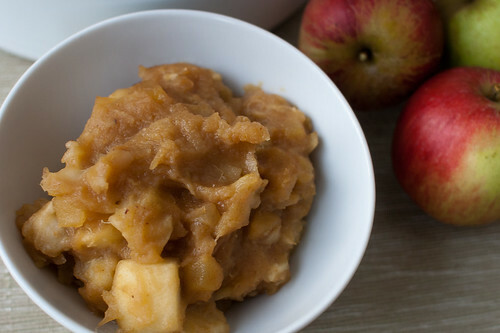 Put this along with the cooked apple and crumble topping and leave to chill thoroughly. Remove the vanilla bean and freeze the custard in your ice cream maker according to the manufacturer’s instructions. 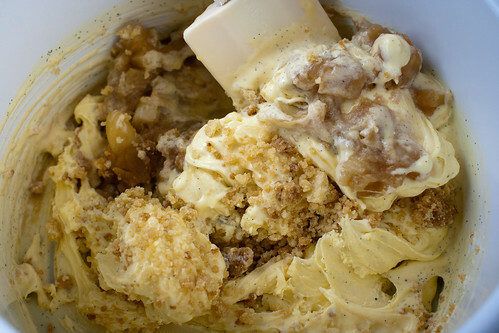 When done, swirl in the cooked apple and crumble topping (use your discretion here – you may not need all of the cooked apple – I added about a heaping 1/2 full to mine). Put everything into a freezer proof container and give it a couple hours to freeze thoroughly before digging in. 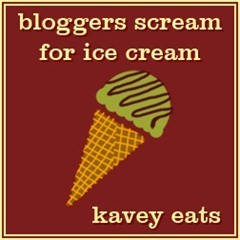 I’m submitting this to Kavey’s Bloggers Scream For Ice Cream spice-themed meme. Oh yes, this does look very autumnal, a perfect recipe for Orchard Cottage, too! Love the mix of spices and I do love a good crumble topping. How quickly did this get eaten?! Kavey I totally binged on it the first night – with lots of extra apple pie filling and crumble topping. There’s still a little bit left but I’m TRYING to save for a treat this week. It’s going to be hard. Good point about the OC – I need to hone this recipe into a “Orchard Cottage Signature Ice Cream” flavour. Good thinking! Thanks, Laura. 🙂 You’re right – it’s a textural delight. Feel free to kick up the rum a few notches – it didn’t really come through in the final taste, not that I missed it, but who knows – it could be just the thing that pushes this over the edge from really good to totally awesome! I’m familiar with ginger root and powdered ginger root, crystallized and raw ginger root, but what is stem ginger? I just love ginger and pairing it with apple this way must be glorious. I still want to try it with pie crust – I think it could have nice chew factor. I’m pretty sure stem ginger is the same as crystallized ginger… I think. In this recipe I’d say the two are interchangeable. 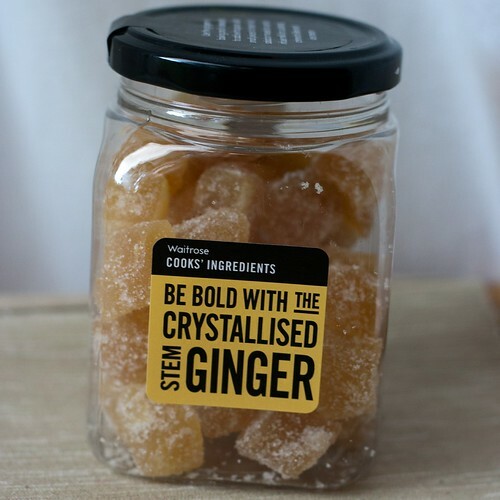 Hi Dottie, crystallised ginger is usually small pieces coated in sugar crystals and stored dry in a container. Stem ginger is often shorthand for stem ginger in syrup, in which pieces of stem ginger have been candied in sugar syrup. The syrup takes on the flavour of the ginger very strongly too. I often use the latter for recipes because I can not only chop the pieces of ginger into the recipe, but also pour some of the gingery syrup, in place of honey or some of the sugar, if need be. That ice cream is rocktastic looking though–I’d like a scoop…like….now! 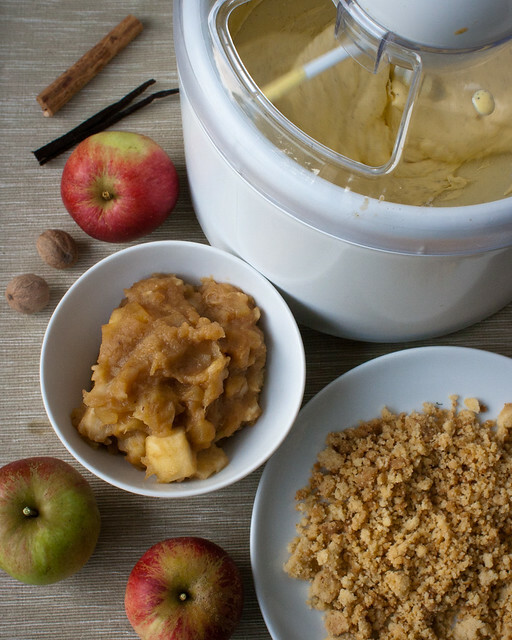 Ginger & apples & crumble all in the custard sounds like the perfect autumn dessert!